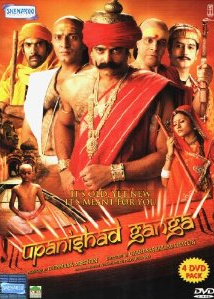 15th episode of Hindi TV Serial – Upanishad Ganga – is focused on Vanprasthashram – i.e. the life of retirement. With the scientific advancement, we know many facts about the life, or rather the science of life. However, there were people who knew the art of living a life! It is very important to know that art, even more important than knowing the science of life. That is why, those who knew the art of life, have provided some guidelines about how to live a life. And, as they are the guidelines, they are not the thumb rules. You may decide to follow it or not, you are free to make your own decisions. That is the essence of ancient Hindu culture. We have already talked about Brahmcharyashram and Grihasthashram (when explored episode 13 and 14 respectively); let us talk about the third ashram – Vanprashthashram and how it is explore in episode #15 of Upanishad Ganga. We all know that Mahabharat war was end with Pandava’s victory over Kauravas. The last of the 100 sons of Dhritarashta killed during the war was Duryodhan (aka Duryodhana). Duryodhana was eldest son of Dhritarashtra whom he loved the most. He was a metaphor of Dhritashtra’s own ambitions actually. Though Dhritarashtra lived with Gandhari in Hastinapur palace and was given the ultimate respect by Pandava king Yudhisthira, the life was not very comfortable for him. Bheem (aka Bheema) was leaving no stone unturned to hurt him by his words. Bheema was unable to forget what happened with him, his brothers and his wife due to Dhritarashtra and his sons. He have no plan to forgive Dhritarashta. Vidura: Oh King, now as the war is over and things are settled, it is time for us to go to the jungle and start our Vanprastha. Dhritarashtra: But the memories of my all 100 sons who are killed in the battle is associated with this palace, how can I leave it? How can I give it all to the Pandavas! Remember, Vidur was including himself also for the people who should go for Vanprastha. Actually, to give the due to the next generation, the previous generation have to move away from the way at the right time. However it is not easy to get detached from the material happiness and emotional baggage so easily. Despite of having ill treated by Bheema always, Dhritarashtra stayed in the same palace for many years. Then one day he realize that he was wrong and he have to leave with immediate actions. When he asked for the permission(!) to king Yudhishthira, he was not ready to permit him doing so. He always respect him like his father and didn’t want this blind fellow to experience hurdles of the life in the jungle. Bheema, however said a direct sentence. Those who actually wants to leave, just leaves. They don’t wait for the permission. Kunti – the wise mother of Pandava also decided to go to the jungle with Dhritarashtra and Gandhari. She made many wrong decisions, but here she was wise and realistic. But is it necessary to go to the jungle to pass the retired life? Is it possible in current scenario? The detachment is main thing. You can start detaching yourself from material happiness, emotional baggage and physical and social relations gradually by living in your home also. The retired life is not to run away from your social life at once. It is, you should understand that the period you have enjoyed as the primary people in the home / job / business / society is over, and now you have to be ready to be secondary there. Be available to guide, but allow the next generation to become the current generation. Allow them to take decisions and let them be active. It is quite possible that despite of living in a jungle or somewhere else, away from the society, you still have ambitions to control the stuff the way you were doing. That is not the retired life. There can be exceptional circumstances, where you need to be active in order to fulfil the needs of your loved ones and/or society. You have to do your duty then. But or otherwise, just sideline yourself respectfully. This segment is written pretty well and dialogs are simple and effective. What catches our attention is the wardrobe of the principal characters. We used to see these characters in larger than the real life persona. Here are are wearing simple cloths, have the look of aged people (who they were during the time of these incidents). The execution is simply superb. K K Raina excels as Dhritarashtra. His dialog delivery, his make-up and other stuff is added with his fantastic body language. He looks more of a character. This is how a king who lost the war and all his sons, who have the great regrets but who still wish to enjoy some comforts despite of being humiliated which he don’t like at all; should be behaving. K K Raina is the gem of the episode for sure. Zakir Hussain – as the narrator is fantastic. He is a brilliant actor. He underperforms as per the needs of the role. The actor playing Bheem is effective. Rest are good. The background music in this segment is effective and reflects the mood of the content shown on the screen. The set are not larger than the life but appealing for sure. If you failed to create the passage for the next generation on time, you might be losing your self esteem and much more. There are many such incidents in the history to look at, where we find the son have killed his father or put him into jail just to get to the throne. The episode explores two tales here, one of Bhadant DevDutt and another of Ajatshatru. Bhadant Devdutt was Gautam Buddha’s brother. He followed Buddha’s path and don the saffron. He became a sage that way. But still inside him, there was a burning of jealousy. He wanted to earn the fame and respect his brother earned. But till Buddha is alive, he always need to remain in his shadow! Ajatshatru was the child of Magadh King Bimbisar. He was the crown prince. But as long as Bimbisar is alive, he cannot be the king! Both of them meet once and decided to move ahead in the direction where they can achieve their goals. Ajatshatru’s mission to kill his father was failed and he was captured. His father however let him go as he cannot kill his beloved son. He cannot be that brutal. But what he couldn’t do, Ajatshatru did. He put his father in jail though. He was generous to let him live! If he (Bimbisar) had given the kingdom at the right time to his son, the things were different. Why can’t we understand the real meaning of the Ashram philosophy and act according? It is tough to give away what you love. But, that is the ultimate fact. You have to leave everything when you breath last. So the detachment has to be started at the right time. In a way you can think that retired life makes you look at the big picture. While you were active your word is always centered on I, me and mine; myself, my family, my business, my home,… However in retired life you should realize that the entire society is your family. वसुधैव कुटुम्बकम. This segment is comparatively smaller. You feel the story of Devdutt didn’t move ahead. If it is mentioned there should be a summary scene for that story as well. Amit Behl as Devdutt is convincing. Abhimanyu as Ajatshatru is effective. The actor playing Bimbisar is good. The dialogs here are simple and effective too. The wardrobe is authentic. The emotional quotient explored here is better than the drama. With effective background music this segment is also watchable. The message of doing the right thing at the right time and leaving the things at the right time; is given effectively in this episode. It is good at content and execution both. Studded with fantastic performances, nice writing and effective execution this episode is definitely worth to go for.